For a slice of isolate serendipity, look no further than roughly twelve-miles East of the Presidio. 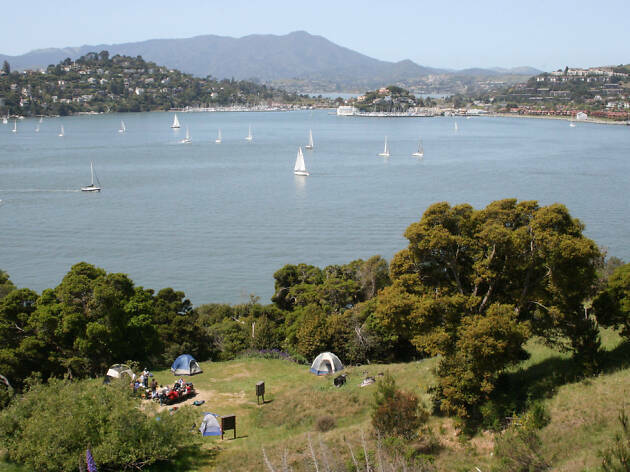 With a choice of sixteen campsites to choose from, divided into four distinct camping areas (East Bay, Ridge, Sunrise, and Kayak Camp), the campsites at Angel Island are rare in that they have both toilets and watering stations close to each individual site. Enjoy picturesque panoramas of San Francisco and the Golden Gate Bridge. 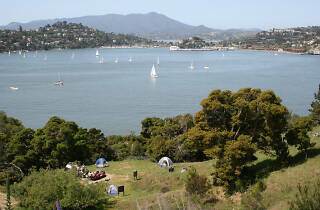 But be sure to pack a windbreaker, too; Angel island is infamous for its steady, chilling winds. If you’re traveling with a larger group, the sites at Sunrise and Kayak Camp can accommodate groups of up to 20. Because of its proximity to the San Francisco Bay, Angel Island offers you some of the best vantage points to see dolphins and whales breaching. Bring your binoculars, gang.